Finished Jan 2019. Final score: 1 / 5. Somehow, dragons were made boring. Temeraire was injured early in the novel and is now laying in a freighter recovering. This is fine... except our dragon laid waiting for 3/4 of the book. This may be the first time I wish I got the abridged edition as a way to shortcut this story. Lawrence spends his days wandering around the dragon transport vessel, talking to diplomats, disciplining upstart underlings, figuring out dragon feeding schedules (since his dragon cannot fish), having dinners with the crew, talking about political maneuvers (how does acting stern to this prince make him appear to his crew? ), and comforting Temeraire during his recovery. Then more dinners. This was the main plot of the book all the way from England to China. Blech. I don't read a dragon fantasy novel to see English kids get fascinated by watching Chinese ambassadors use chopsticks. I read a dragon novel to see dragons. As soon as Temeraire recovers, he comes down with a cold and is grounded again. When they finally get to China, Temeraire spends his days prattling about. Lawrence has more dinners with diplomats. Here is how to read this book. Read it normally until Temeraire is injured. Skip everything until the last 3 chapters. The only thing you will miss is Temeraire recovering from an injury, dinners, and small talk with diplomats. 75% of this book is a waste of time. Score 1/5. A swing and a miss. This book is like watching a movie you keep waiting to get good, but then it never does. I still like the premise laid down from book 1. Temeraire is an interesting character, so I am not yet ruling out book 3 completely despite this weak entry. I'm certainly not eager to continue it. Get this audiobook from Walmart/Kobo. 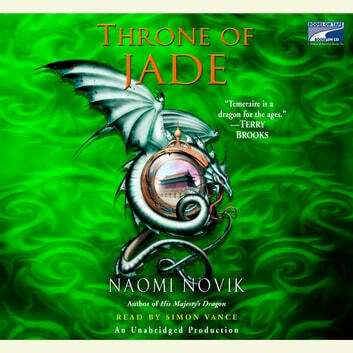 Discuss Throne of Jade (Book 2) in the forums.